MyFavouriteMagazines is the official magazine subscription store of Future. You can save up to 74% on a huge range of popular magazine titles. Every magazine subscription will be delivered direct to your door, and includes free UK delivery; guaranteeing you don’t miss a copy of your favourite magazine. Don't be unlucky this Friday the 13th - enjoy 13% off your entire order. There is no minimum spend and can be used on anything across the store - including already discounted magazines and even clearance sale items too! Simply use voucher code FRIDAY13 at the checkout. Offer ends Midnight BST 14th July 2018. *Offer starts 00:00 BST 13th July and ends 00:00 BST 14th July 2018. No minimum spend required. Not valid with any other promotion or voucher. Please note for direct debit payments, the discount only applies to the first payment. Enjoy 20% off your order this weekend at MyFavouriteMagazines.co.uk. Your discount is valid on everything across the store including already discounted magazine subscriptions so you'll save even more when you subscribe, as well as back issues, guides, specials, merchandise and even clearance sale items too! Simply use voucher code MAY20 at the checkout. Offer ends 10:00 BST 29th May 2018. *Offer starts 25th May 2018 and ends 10:00 BST 29th May 2018. No minimum spend required. Not valid with any other promotion or voucher. Please note for direct debit payments, the discount only applies to the first payment. Hurry, offer ends 17:00 BST 29th September 2017. No minimum spend required and all prices include delivery. *Offer starts 17:00 BST 28th September 2017 and ends 17:00 BST 29th September 2017. Apply discount code (MAGS24) at checkout. Not valid with any other promotion or voucher. Please note for direct debit and continuous credit card subscriptions, the discount only applies to the first payment. We've just reduced and added loads of fantastic products to the MyFavouriteMagazines Clearance Sale. Browse now and pick up a guide or special at a great price! Hurry - some items have limited stock! Don't forget that all prices include delivery. *50% off applies to a selection of products in the clearance section and is not representative of every product. Please refer to the clearance section here for specific reductions. Prices are subject to change. Keep all 13 issues of your magazine subscription together with a binder or slipcase. Watch a tutorial about your favourite hobbies and interests. Or enjoy a branded mug or T-Shirt for the every day. Hurry! This offer is valid for a limited time only. Offer ends 17:00 BST Monday 11th September . Use code MERCH15 at checkout. Offer is available to UK and overseas customers. All prices include delivery. Get involved with the myfavouritemagazines sale and enjoy up to 20% off your favourite magazines and merchandise. Spend £10/€11/$13 to save 10%, £20/€21/$26 to save 15% or £30/€32/$39 to receive 20% off your order total. From music to field sports and design to knowledge titles available, there's something for everyone. Hurry! This offer is valid for a limited time only. Offer ends 12pm BST 4th September 2017. Discount automatically applied at checkout. Offer is available to UK and overseas customers. All prices include delivery. Try something new or indulge your hobby with our 3 for 2 offer on single issue magazines. You'll find the latest 6 issues to each of our magazine subscriptions so you can catch up on the latest tech innovations, learn more about our natural world and read the most recent film reviews all in one day. Hurry, offer ends 17:00 BST 21st August 2017. Discount will be automatically applied when 3 single issue magazines are added to the basket. No minimum spend required and all prices include delivery. 24% Off For 24 Hours! Our 24 hour sale is now on! Save an amazing 24% on your favourite magazines and binders with voucher code 24SALE. Whether you want to read more about your favourite hobby or try something new, there's a magazine subscription, guide or special for everyone. *Offer starts 17:00 BST 31st July 2017 and ends 17:00 BST 31st August 2017. No minimum spend required. Enter code at checkout. Not valid with any other promotion or voucher. Please note for direct debit and continuous credit card subscriptions, the discount only applies to the first payment. Whether you're interested in film or music, photography or gaming, there are guides & specials for everyone which can be enjoyed in the garden, in the park or on the beach this summer. There's also plenty of reading material to keep the children learning this summer holiday with fun yet information magazines from our Knowledge category. Hurry! This offer is valid for a limited time only. Offer ends 11am BST 24th July 2017. Use discount code at checkout. Offer is available to UK and overseas customers. All prices include delivery. Our summer sale has arrived! Pick up a magazine subscription with our 5 issues for £5 summer sale offer now. Why not indulge your hobby or try something new? Whatever your interest, we have a magazine suited to your needs. Shop for your favourite magazine subscription now. Hurry! This offer is valid for a limited time only. Offer ends 10am BST 14th July 2017. Discount automatically applied at checkout. Offer is available to UK and overseas customers. All prices include delivery. We have your favourite magazines! We've recently added some more popular titles to our magazine subscription store. You'll now find educational subscriptions such as How It Works, All About History and World of Animals, popular gaming titles such as Games TM and Retro Gamer, and creative magazines such as iCreate and Web Designer. With such a wide selection of special interest magazines to choose from, our products will suit readers of all ages. SAVE AN EXTRA 10% OFF OUR CLEARANCE SALE! You can now save an extra 10% when you checkout with a product in the MyFavouriteMagazines Clearance Sale. Browse now and pick up a fantastic guide or special at a great price. Hurry - some items have limited stock! The 10% discount will automatically be applied at checkout. Plus, don't forget that all prices include delivery. MyFavouriteMagazines is the official magazine subscription store of Future Publishing. You can save up to 74% on magazine subscriptions, guides & specials, back issues and binders which will be delivered direct to your door, guaranteeing you don’t miss a copy of your favourite magazine. 24% off all magazines for 24 hours! Don't forget that you can use the code on anything in the store including guides, specials, single issues, binders and clearance sale. No minimum spend required and all prices include delivery. *Offer starts 14:00 BST 31st May 2017 and ends 14:00 BST 1st June 2017. No minimum spend required. Not valid with any other promotion or voucher. Please note for direct debit and continuous credit card subscriptions, the discount only applies to the first payment. Our weekend sale is now on. 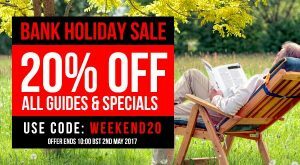 Enjoy big savings off your favourite magazine subscriptions, guides & specials or binders with voucher code WEEKEND20. Hurry! This offer is valid for a limited time only. Offer ends 10am BST 2nd May 2017. Use code at checkout. Offer is available to UK and overseas customers. All prices include delivery. Don't miss out! Save a massive 24% off everything at MyFavouriteMagazines.co.uk. There's only 24 hours to use voucher code SALE24 so be quick and shop now! Hurry, offer ends 3pm GMT 13th December 2016. *Offer starts 15:00 GMT 12th December 2016 and ends 15:00 GMT 13th December 2016. No minimum spend required. Not valid with any other promotion or voucher. Please note for direct debit and continuous credit card subscriptions, the discount only applies to the first payment. Enjoy 20% off absolutely everything at MyFavouriteMagazines.co.uk. Our magazine subscriptions have already been reduced so it's a great time to subscribe whether you're looking for Christmas gifts or wanting to treat yourself this Black Friday. Simply use voucher code SALE20 at the checkout for 20% off everything including single issues, guides & specials and merchandise too. Make great savings all weekend right through to 10am GMT 29th November 2016. *Offer starts 10:00 GMT 25th November 2016 and ends 10:00 GMT 29th November 2016. No minimum spend required. Not valid with any other promotion or voucher. Please note for direct debit and continuous credit card subscriptions, the discount only applies to the first payment. 20% off everything! 24 Hours only! Happy Halloween! Don't miss our fang-tastic offer of 20% off everything - valid for 24 hours only. Don't forget that our magazine subscription prices have recently been reduced so you can make even bigger savings this Halloween. All you need to do is use voucher code TREAT20 at the checkout. Offer starts 10:00 GMT 31st October 2016 and ends 10:00 GMT 1st November 2016. Don't forget that all prices include delivery. Great news! We've just lowered our magazine subscription prices for print and print + digital bundles. Subscribe from only £5, plus save an extra 20% for a limited time only with voucher code AUTUMN20. Our voucher code is valid on everything at MyFavouriteMagazines so you can make fantastic savings on guides & specials, single issues and merchandise too! Offer starts 10:00 BST 10th October and ends 10:00 BST 14th October 2016. Don't forget that all prices include delivery. *Offer starts 10:00 BST 10th October 2016 and ends 10:00 BST 14th October 2016. No minimum spend required. Not valid with any other promotion or voucher. Please note for direct debit and continuous credit card subscriptions, the discount only applies to the first payment. 20% voucher code! 24 hours only! PayDay is finally here! To celebrate, we're offering 20% off everything atMyFavouriteMagazines. Treat yourself to a magazine subscription or shop our fantastic range of guides and specials. This offer is valid on single issues, merchandise andclearance items too! Offer available for 24 hours only, from 10:00 BST 30th September and ends 10:00 BST 1st October 2016. Enter voucher code PAYDAY20 at the checkout. Simply use voucher code MAG24 at the checkout for 24% off everything at MyFavouriteMagazines.co.uk. Voucher is valid on everything including magazine subscriptions, guides, specials,merchandise and even clearance items. No minimum spend required. Simply use voucher code 24HOUR at the checkout for 24% off everything at MyFavouriteMagazines.co.uk. Save 10%, 15% or 20% in our secret discount promotion. Sign up to the MyFavouriteMagazines newsletter between the 22nd and 26th April and you'll receieve one of our three frantastic discounts. Offer starts 10:00 22nd April 2016 and ends 10:00 26th April 2016. *Your secret discount voucher has no monetary value. Not valid with any other promotion or voucher. The 10% voucher is only valid once the basket value reaches over £9/€15/$18, the 15% voucher is only valid once the basket value reaches over orders over £19/€29/$32 and the 20% voucher is only valid once the basket value reaches over £29/€43/$46. Voucher will run from 10:00 22nd April 2016 until 10:00 26th April 2016. For direct debit and continuous credit card subscriptions, the discount will only be applied to the first payment. To recieve your secret discount, sign up to the MyFavouriteMagazines newsletter. For full terms and conditions please click here. Save up to 70% on guides and specials in the MyFavouriteMagazines Clearance Sale and for 4 days only get an extra 10% with voucher code CLEARANCE10. Browse over 60 discounted bookazines, guides and specials from only £3! New items have just been added plus further reductions on many items.